The story of 2018 has been one of U.S. growth, but not necessarily global growth. While most major economies around the world are still expanding, they have been decelerating or holding steady, whereas the U.S. economy has been picking up steam. As is typically the case, a stronger relative outlook for the U.S. has led investors to bid up the dollar, which is causing a reshuffling of the cards. Currencies always have a way of sharing and redistributing growth around the globe, and this time is no different. Making the case for a robust U.S. economy is easy. We just recently saw the highest GDP print in nearly four years (4.1% annualized), the unemployment rate remains near its lowest level in two decades, and corporate profits have soared to record levels (up over 24% YOY for the second quarter). As a result, major stock averages have recovered nicely. In the chart below we can see that since the February swoon, domestic markets have regained nearly all of their losses, but international markets have not. 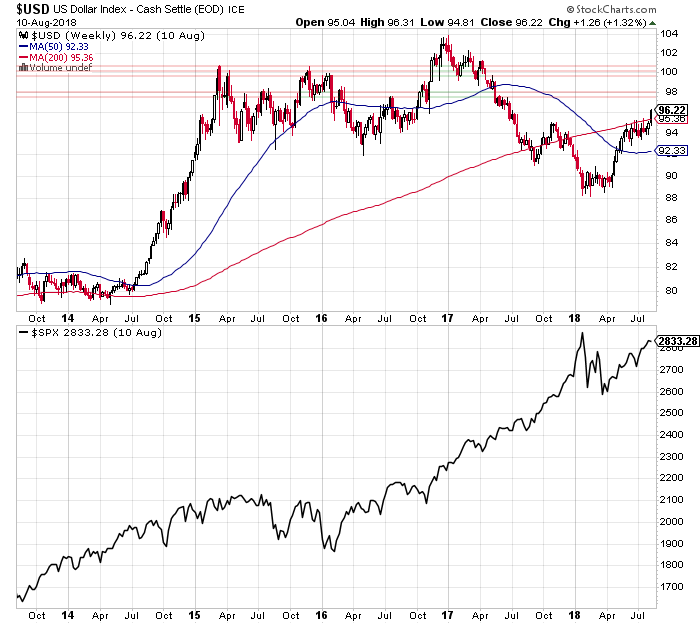 The continued appreciation of U.S. assets has further fueled a desire to own dollars, and that has resulted in a strong move higher for the buck. 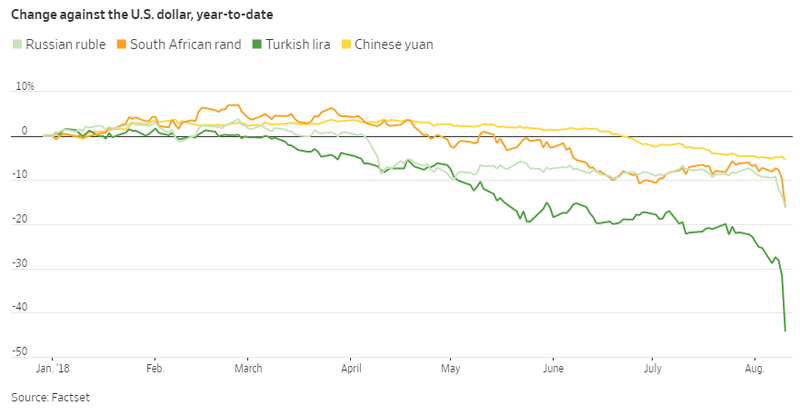 Add in recent concern about the Turkish lira, which is causing broader weakness in the euro, plus all the commotion surrounding tariffs and trade, and it seems that nearly all international currencies have been heading lower. A few of the major movers are highlighted below. The net result has been a surge higher in the dollar index. In the chart below we can see that the dollar’s appreciation began in earnest in April, and continued for about six weeks. It then entered a period of consolidation before just recently breaking out of its trading range to the upside. Much of this latest move has come as a direct result of the massive devaluation in the Turkish lira. In addition to weighing on other emerging market currencies, the decline is also acting as an anchor on the euro. That’s because there are concerns over European bank exposure to Turkey, as well as a decreased risk appetite for southern European bonds in general. But as we all know, weaker currencies (but not too weak, where they begin to illicit capital outflows) are nearly always a boon to their respective countries. A weaker euro will promote growth in export-dependent countries such as Germany, which has been struggling lately, and of course, a weaker Chinese yuan will help China to offset some of the damage being done by tariffs. Unfortunately, however, the benefits amassed by these countries due to their depreciating currencies is likely to come at a cost to the U.S. The stronger dollar will dampen our export growth (which accounts for ~14% of GDP and surged 9.3% during the second quarter), and will result in foreign earnings being translated back into fewer dollars. 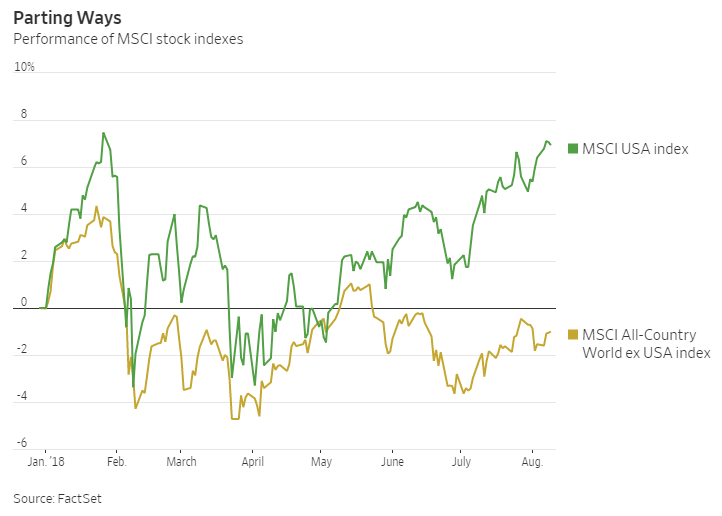 Global investors understand this dynamic well, and as a result will probably be less likely to continue pushing U.S. markets higher. This is not to say that we’ll have a flat or down back-half of the year, only that it will dampen overall enthusiasm. One of the key levels we’ve been watching in the dollar index has been the 95 level. There is (or rather, was) strong resistance at this level that held the dollar in check for over two months. But as you can see below, we’ve recently hurdled that level. This means that from a technical perspective, the dollar is becoming more bullish. However, as the five-year chart below shows, there is a lot more resistance all the way up to around the 100 level. This suggests that further increases from here should be tempered. But either way, a stronger dollar is not a boon for equity bulls. The last time the dollar exploded higher (from mid-2014 to early 2015), it caused a muddle-through period for the U.S. economy, and actually triggered an earnings recession beginning in the third quarter of 2015. In the lower chart above, we can see that this episode led to a year-long period of flat to lower equity prices before the market finally gathered itself and began moving higher. Could we see a similar effect this time around? It’s certainly possible, but the move we saw back in 2014 was substantially larger than the move we’ve seen over the past four months. This time around, the appreciation has been moderate, so it’s unlikely to completely derail economic growth here in the U.S. But one thing it could derail, which could be both good or bad depending on your perspective, is rate hikes. Inflation has been pushing higher recently, allowing the Fed to continue along its path of rate increases. But a rising dollar is itself a form of monetary tightening. Should the dollar continue to appreciate, it will put downward pressure on inflation and could steady the Fed’s hand moving forward. Whether the market would interpret this as a positive or negative development is anyone’s guess. Since we’re on the topic of the dollar, and I seem to hear constantly that the dollar is doomed and on its way to becoming nothing more than kindling, I thought I’d show the following chart along with a few comments. This chart, which uses data from the International Monetary Fund, shows foreign exchange reserves across the globe. It’s evident that total allocated reserves have grown sharply, but so have the value of reserves held in U.S. dollars. As a percentage, allocated reserves held in U.S. dollars have declined slightly, but the buck still accounts for 62.5% of total allocated reserves. For comparison, the euro now accounts for 20.4%, with the remainder split across various other currencies. Subscribers might also find it interesting to note that 88% of all trades in the $5.1 trillion a day foreign exchange market involve the dollar. 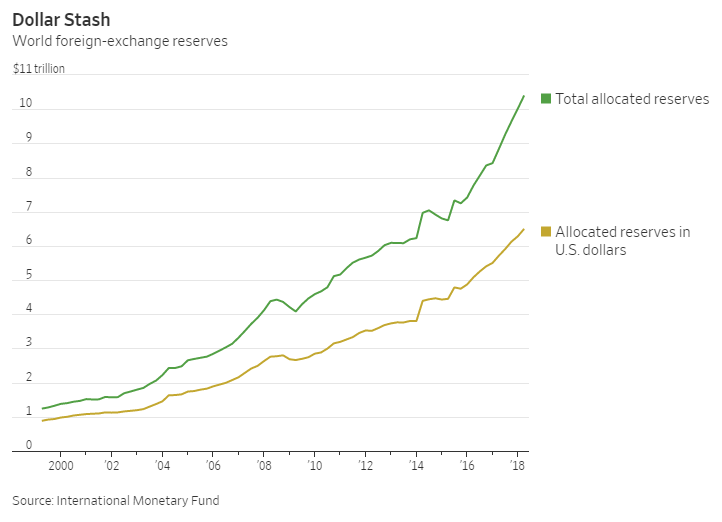 So the idea that the dollar is losing its status as the reserve currency of the world is, well, a little overblown. Wrapping things up, it’s clear that the dollar is firmly bullish at the moment, but it’s unclear how far the dollar could run. If it continues to advance in response to weaker conditions abroad, there’s a good chance we’ll see equity markets here take a pause while the dollar becomes a conduit through which U.S. growth flows to our neighbors. This is clearly a critical item to watch moving forward. The preceding content was an excerpt from Dow Theory Letters. To receive their daily updates and research, click here to subscribe. Matt is also the Chief Investment Strategist at Model Investing. For more information about algorithmic based portfolio management, click here.